It is always more pleasant to be in an environment where the living is easy, where you feel at home. This is something that Richard is fully aware of. That’s why he decided to create his own table to customise his Lagoon. Can you introduce us briefly to you and your family? My name is Richard Petit, I am a producer and art director of the shows “The Wall Live Extravaganza” and “Space: The Best of Pink Floyd Show”. My wife, Marie-André Poulin is a cultural journalist for the TVA and LCN television channels. We live in Montreal with our daughter Gabrielle who is 4 years old. Why did you choose a Lagoon? After a delivery between Nassau and New York on board a 400, I realised that this size of boat was ideal for our family. The comfort, safety and performance met our needs precisely, and when the 40 was announced, I took the leap. We chose the version with 3 cabins and 2 bathrooms, so as to be able to have friends and family on board too. Our Lagoon was named after our daughter: LADY GABY. How did you customise your boat? I was looking for somewhere to express my creativity on my Lagoon. This wasn’t easy since the model is impeccable. 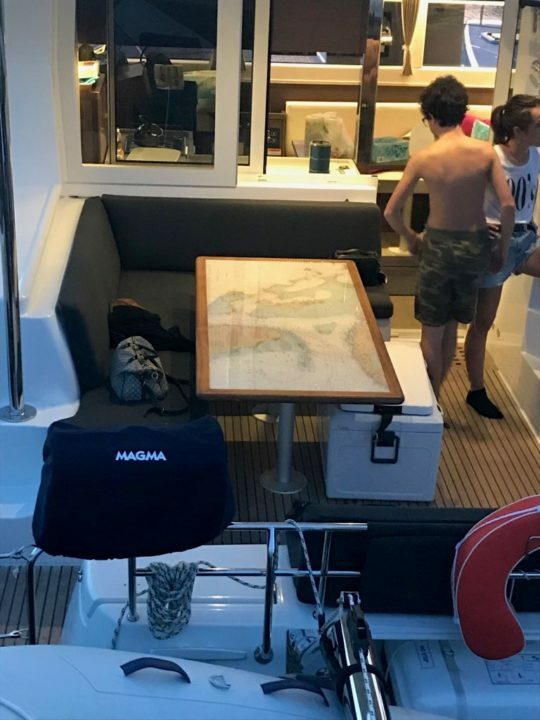 I thought that the cockpit table could become a work of art. It turns out that I used to work with wood and did lute-making studies. Furthermore, I’ve been fascinated by cartography for many years. This seemed a good mix to create an original table. Did you appeal to professionals to create this table? 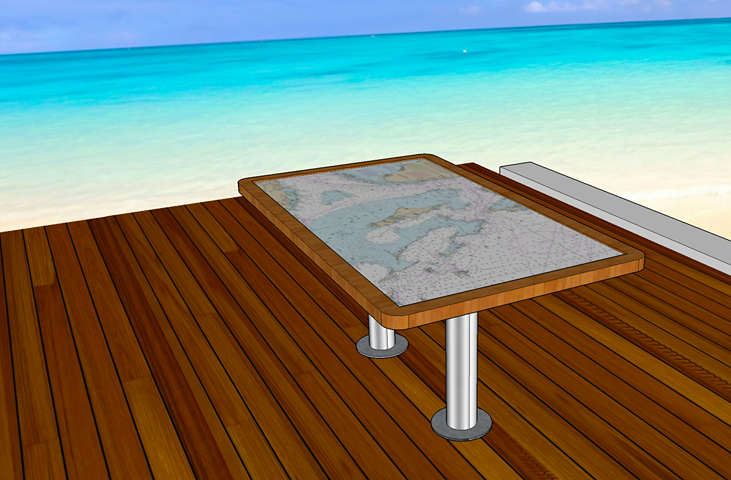 I made 95% of the table myself because I’m used to working with wood in my spare time and creating 3D sketches. 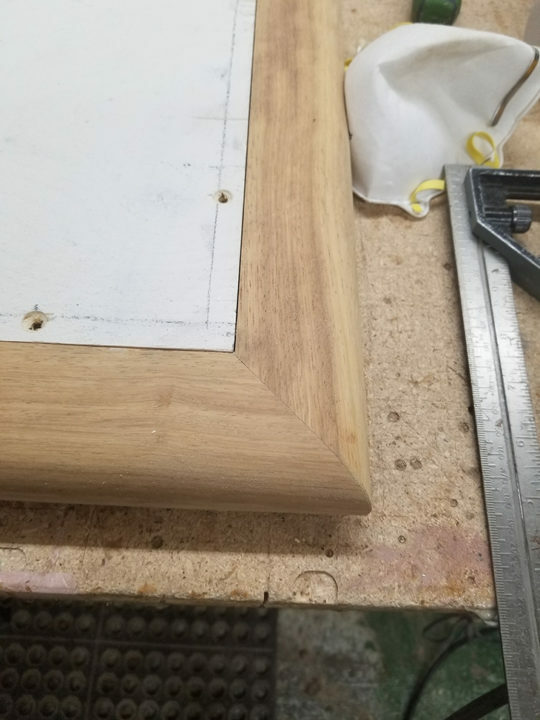 I did have to call a friend to design the (woodworking machine on which you place the piece of wood to work it with the spindle), so as to make the table’s outer edge. How did the customisation project go? First, you have to visualise how it will look at the end. 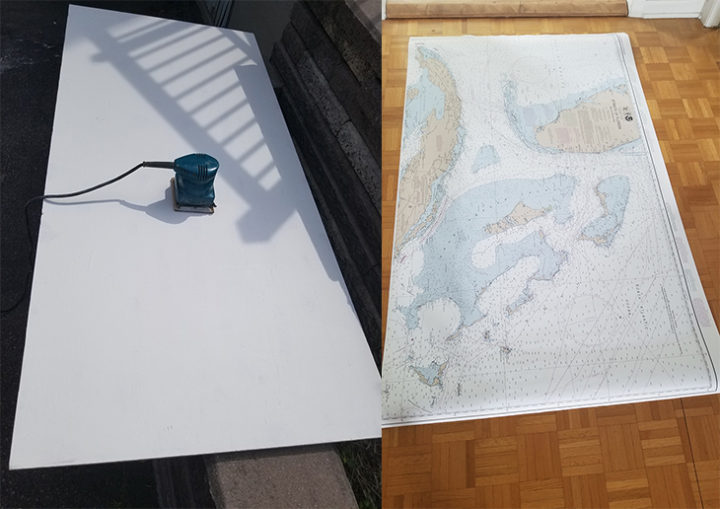 To do so, you must make a 3D sketch and insert it in a picture of the boat. Then, you must choose the materials carefully. Using teak may seem obvious but I chose iroko – this is similar wood with ideal properties for maritime conditions. Once the frame was assembled, I created a stand with a plank of oil-sealed plywood. 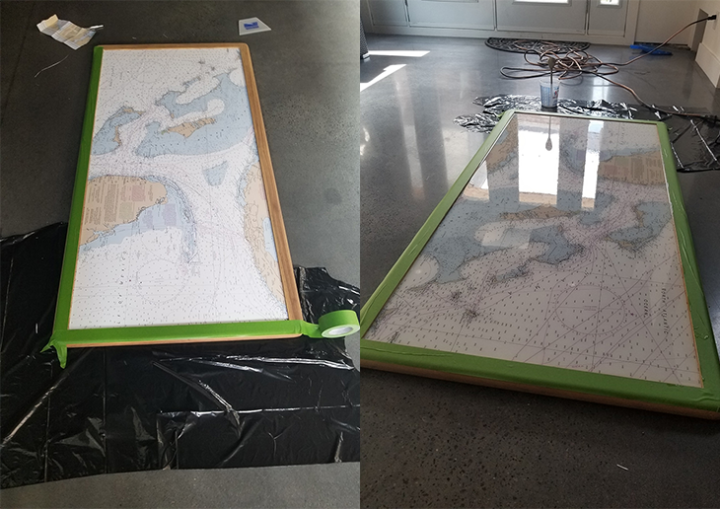 After making sure the surface was smooth, we could start sticking the map. I chose a NOAA map where you can see all of the Bahamas, part of Florida and Cuba. Once the size was adjusted, I stuck it onto the stand. Then came the crucial step, applying the epoxy resin: I chose a very light UV resistant finish, then all I had to do was polish the wood one last time and apply the protective oil. 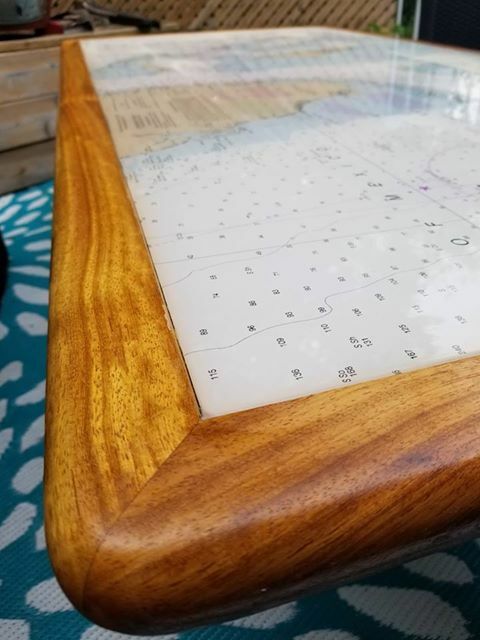 We now have the map of our sailing area at hand, adding memories and stories to our meals. Do you have any other customisation projects? When the first year of renting-management is over, we’ll see if the table is in good shape. In that case, I’d be happy to take private orders to help other Lagoon owners customise their boat. Concerning LADY GABY, I added a Sirius antenna to get the then I changed the Hi-Fi for a slightly more powerful sound system to let the musician inside me express himself! A Pivoting Davit System Designed by Sylvie and Patrick!